Today there will be a huge festival (yes another one) celebrated at the holy site of Ganga Jumina situated half way up the mountain behind Majuwa Village. People travel from far villages far away to attend this festival. All day people streamed past our campsite, some only go to the temple to pray then return home where as tousands gather at the site, sing, dance, play cards and generally party all night. This year the festival will be attended by the Minister of Tourism, who will arrive by helicopter. Jen is leaving us today and we are sad that she is going, as she has been great fun lots of laughs, and a hard worker. Christine and I walked with her the to her jeep pick up point at Fulkharka, where we had a meeting time of 10am. 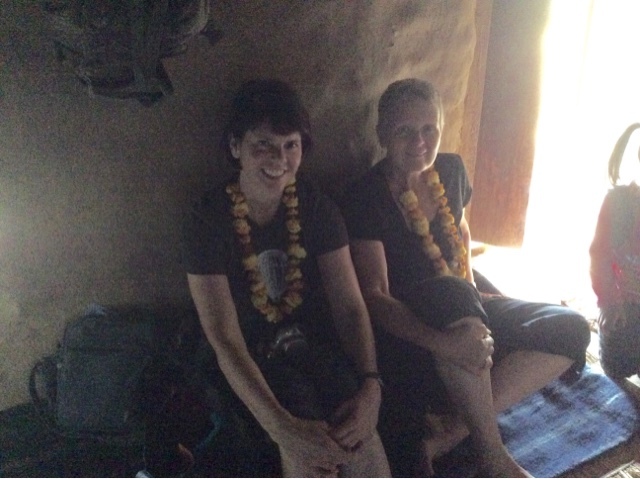 Jen was to be joined by 2 other tourists from the USA working as missionaries in the district of Fulkharka where there were many Christian Churches destroyed in the earthquake. Typical of Nepali time they were 2 hours late, meaning that they would not arrive into Kathmandu until 7 or 8pm. After our sad farewell Christine myself, Dil and Santi returned to our campsite for a late lunch, we then made our daily hike to our bathing place, this time watched by the hordes of people trekking to the festival, no privacy over here! Both Christine and I decided not to take the hike to view the festival, but instead relax at the camp, read and have an early night.